The Oconee County Planning Commission tomorrow (Tuesday) night will consider a request to convert a portion of the former Green Hills Golf Course and Country Club in the far east of the county to a ministry college. Green Hills Farms LLC, the current land owner, is seeking a special use to allow the Athens College of Ministry to develop a campus on just more than 100.2 acres on the agriculturally-zoned land. Green Hills Farms LLC currently owns 189.2 acres in the small triangle of Oconee County on the east side of the Oconee River tucked between Athens-Clarke County and Oglethorpe County. The property has been vacant since 2009. 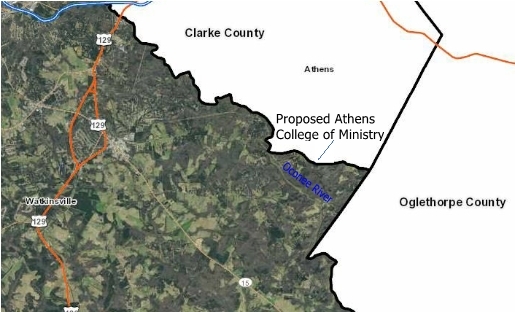 Oconee County currently does not provide either water or sewer to the land to the east of the Oconee River, and the narrative for the development states the college will seek to obtain water from Athens-Clarke County and rely on septic in the short term. Also tomorrow night the Planning Commission will consider a modification of the plans for a small subdivision on Daniells Bridge Road to reduce lot sizes and a request by Watkinsville First Baptist Church to expand its facilities on Simonton Bridge Road just outside the Watkinsville city limits. The Athens College of Ministry is an interdenominational Christian college “seeking to equip faithful men and women for ministry and Christian leadership,” according to the rezone narrative. The College was founded in 2009 and began accepting students in 2012, the narrative states. The college currently is meeting at Watkinsville First United Methodist Church, 1331 New High Shoals Road, north of Watkinsville. The proposal is for a $24.3 million project that will include 30 buildings upon completion. The plan is for a phased construction from 2017 to 2025 and beyond, as the college grows. The total projected student body is 750 at buildout. A 20,600-square-foot administration building will be the first structure, according to the narrative. The building will include two large classrooms, a library with student conference room, faculty offices, a prayer ministry room and office, small kitchen, and equipment storage area. The property fronts on Barnett Shoals Road east of the river just before Barnett Shoals Road turns north into Athens-Clarke County. The narrative states that the development will require domestic water, fire protection, and sanitary sewer services in addition to electricity, natural gas, television and Internet service. The total estimated water demand for the full build-out of the campus is 56,550 gallons per day. 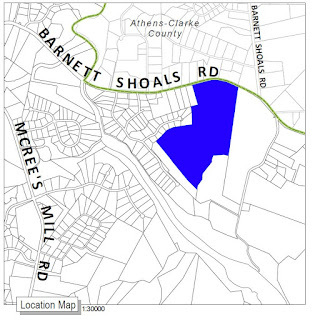 Currently, the closest Oconee County water main is approximately 1.25 miles west along Barnett Shoals Road, so the property owner is proposing that Oconee County and Athens-Clarke County enter into an intergovernmental agreement so the latter can provide water until Oconee County extends its water line. Short term plan includes providing conventional septic systems for individual buildings proposed for the initial phases of construction, according to the narrative. The staff is recommending approval of the special use request. RWJ Inc, owned by Rodney Jones, is seeking to modify the approved plans for Downs Creek Farm subdivision, now under development on the west side of Daniells Bridge Road just south of the bridge over Barber Creek. The county rezoned 52.8 acres for the subdivision in January of 2014, with 11 lots. Subsequently, RWJ Inc. sold two of those lots to David Mulkey, who combined them with adjoining acreage he purchased. Jones is now seeking to change the rezone so he can build 11 houses on the remaining 33.4 acres. Three houses already are under construction, according to the planning documents. The staff has recommended approval of the request. The staff also recommended approval of the expansion of Watkinsville First Baptist Church on the 17.7 acre-tract at Simonton Bridge Road and Norton Road. The Planning Commission meeting is scheduled to begin at 7 p.m. at the Courthouse in Watkinsville. That is a huge development of a college without any infrastructure present. If the Christian college is going to build its campus in Oconee County, it should purchase its water from Oconee County. If their plan is to use Athens for water and Oconee for sewer, that would be a non-starter for me. From what I've learned in all these sewer discussions, water makes money and sewer loses money. The Planning Commission should recommend all utilities should be serviced by Oconee County. I see no reason why Oconee has to give that water business to Athens when the county is hard-pressed with sewer capacity as it is. Oconee County does not have water lines that could serve the project. To provide water, the county would have to run a line across the river. The bridge cannot carry the line, so some other method would have to be found. That is why the College is proposing to get its water from Athens-Clarke County in the short term. The Planning Commission did not have a quorum on Tuesday night, so the decision will be put off until February. so consideration thus approval/denial is blithely put off a month. Anyone sinking untold hours of planning and money is SOL. They are going to rent out the proposed facility and operate a camp. Sounds like the "college" is just a ruse.